The Bermuda Petrel, or Cahow, is one of the rarest seabirds in the world. Once numbering one million birds, the species disappeared quickly for many reasons. Thought to be extinct for 300 years, a scientific expedition in 1951 discovered seven nesting pairs on one of the Bermuda islands. David Wingate was a 15 year old boy on that expedition and has since devoted his life to bringing back this iconic seabird. Through the heroic efforts of David and Jeremy Madeiros, the species is slowly making a comeback and there were 117 breeding pairs in the 2016-2017 season, producing a record total of 61 successfully fledged chicks. In November 2017, I participated in a trip to Bermuda known as the "Cahow Experience". Bob Flood has been organizing and leading these trips for small groups of birders since 2010 so that they can experience the magic of the Cahow. Highlights of this trip were six pelagic trips to observe and photograph Cahows at sea, meeting David Wingate and Jeremy Madeiros, and visiting the translocation colony on Nonsuch Island to observe the birds in hand. This trip ranks at the top of my lifetime experiences. The Cahow is truly a magical bird and I'm feeling very fortunate to have some of that magic transferred on to me. Read more about this amazing story at https://neotropical.birds.cornell.edu/Species-Account/nb/species/berpet/overview/ and watch the current season live on the CahowCam at http://www.nonsuchisland.com/live-cahow-cam/. Also, check out Bob Flood's website at http://www.scillypelagics.com/. 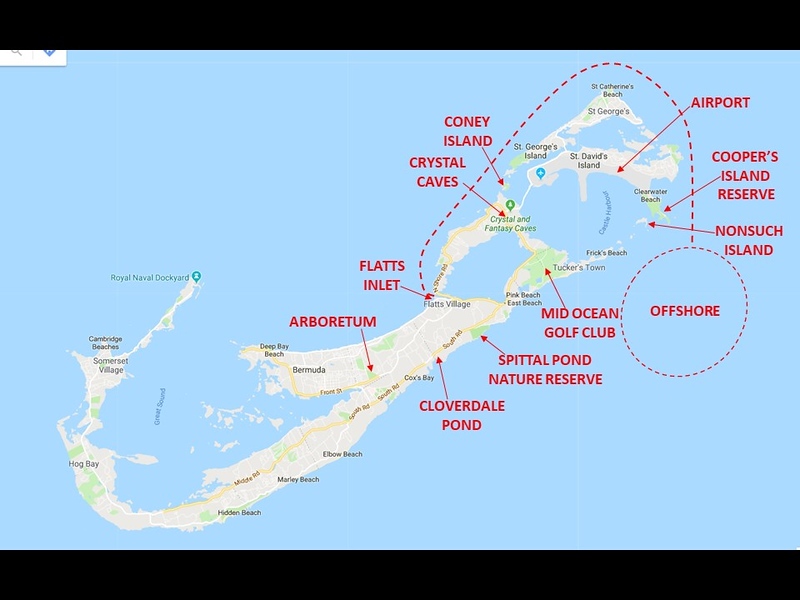 Some of the locations that we birded around the islands.